Car thieves sure seem to have tiny erections for rear-engined cars lately. We've seen a new string of Beetle thefts, and now we have another very iconic posterior-powered car stolen: A Delorean. And this one's even more unusual: it's black (a dealer-applied non-color), and has only 636 miles on the clock. As always, any theft of someone's car is awful, but stealing a clearly unique and loved classic is, of course, grounds for getting your "I'm A Worthwhile Human" rewards card revoked. Plus, how the hell can you fence something as distinctive as this? 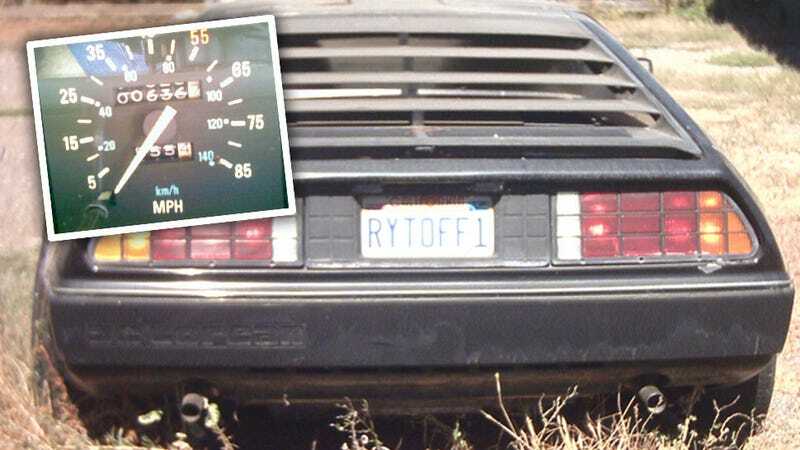 A black-painted Delorean, with incredibly low mileage, and a personalized license plate. It doesn't make sense. Tonight (9/17), my uncle called me from California with some sad news that my uncle's most prized of possessions, a dealer painted Black DeLorean DMC-12 with wire wheels was stolen from his property in Morgan Hill, California! Since he has been in the process of moving to a new house and the DeLorean was still at the old property, the last he saw it parked was a week and a half ago and when he went by the property tonight he foudn that it had been stolen! The DeLorean was not in running condition and more than probably must've been flat-bedded out or something. Some details are that it has some sheepskin seat covers, a cracked windshield, faded black paint and a cracked dash amongst other small things. I would be HUGELY in debt to you all if ANYONE could help us find the poor old girl. The reason the's been in such rough shape is because my uncle has had financial difficulties for quite a while and never managed to save up enough to get it running again. But he could never let it go because it was a part of him! This one should be pretty easy to spot. Let's keep our eyes open, and see if we can't help. I bet we can! UPDATE: It looks like the car has been located. Please refrain from calling, emailing or texting the Craigslist ad mentioned in the comments so we don't tip off the seller that he's an idiot. More updates to come!